School is back in session. The nights are getting cooler. The leaves are beginning to change color. That’s right. Fall is on its way. And if you’re looking to get out and enjoy this wonderful season, there are dozens of festivals and events happening around the state. As part of our ongoing series featuring some of the COOLest restaurants, activities and events Minnesota has to offer, we’ve dug up 27 fall festivals, events and fun things to do. 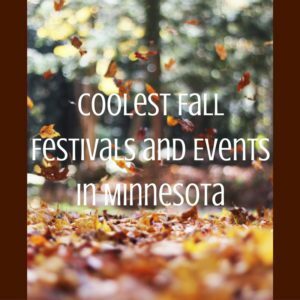 Here’s your guide to fun fall events happening throughout Minnesota during the 2018 fall season. Tickets: General admission: $24.95 for adults. $15.95 for kids. Discounts and specialty tickets available online. Ticket Prices: $15 for ages 4+. $12 discount tickets available for groups. Coupon available online. Dates and Times: 7 p.m. to midnight Fridays and Saturdays Sept. 6 through Oct. 27, 2018. For MEA, Halloween Haunt will also be from 7 p.m. to midnight on Thursday, Oct. 18, 2018. Ticket Prices: $36 online if you visit early. See website for more details. Ticket Prices: $10 online & $12 at the gate. Kids under 36″ are free. Ticket Prices: $9.00 general admission. Kids 2 and under are free. Ticket Prices: $23.95 general admission. $20.95 if you purchase your ticket in advance online. Ticket Prices: Prices vary by event. See website for details. Ticket Prices: Varies by activity. Ticket Prices: Varies by event. Ticket Prices: Vehicle permit is $7 daily or $30 annual. Ticket Prices: $25/team Friday & Sunday, $35/team Saturday. Must be 16+ to particpate. Ticket Prices: $119.99 and up. Kids 16 and under are free. All passes include camping. Ticket Prices: $14 for adults. $8 ages 6-11. Kids 5 and under are free. Ticket Prices: Free with plenty to buy for art and eats. Dates: 10 a.m. to 6 p.m. Oct. 13-14, 2018 (See the full schedule for specific times). Ticket Prices: $28 for general admission. Ticket Prices: Adults $10. Seniors $9. Kids under 10 are free. Ticket Prices: $20 for Saturday’s concert. Workshops are $7 each or $30 for the day. Ticket Prices: Advance tickets for the two-day event are $30 per person. Non-advance tickets are $40 per person. Location: Great River Road Wine Trail, a self-guided tour of 11 wineries in Minnesota, Wisconsin, and Iowa. We truly hope you’re able to get out and enjoy Minnesota’s fall season. If you find your way to one of these spots, please share a photo or two with us on Facebook or Twitter. If you think we missed a great event, share the details in the comments section below. And of course, we like to think of ourselves as the COOLest heating and cooling company in town. If you’re in need of HVAC repairs, maintenance or just have questions, get in touch with us today.